The majority of blunt chest injuries are minor contusions or abrasions; however, life-threatening injuries, including tension pneumothorax, hemothorax, and aortic rupture can occur and must be recognized early. This review focuses on the diagnosis, management, and disposition of patients with blunt injuries to the ribs and lung. Utilization of decision rules for chest x-ray and computed tomography are discussed, along with the emerging role of bedside lung ultrasonography. Management controversies presented include the limitations of needle thoracostomy using standard needle, chest tube placement, and chest tube size. Finally, a discussion is provided related to airway and ventilation management to assist in the timing and type of interventions needed to maintain oxygenation. The Endotracheal Tube (ETT) Depth and Tidal Volume Calculator estimates depth of optimal ETT placement and target tidal volume by height. The Blast Lung Injury Severity Score stratifies primary blast lung injuries into 3 categories to guide ventilator treatment. 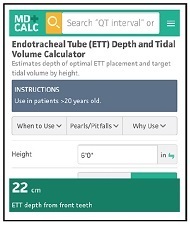 The Endotracheal Tube (ETT) Depth and Tidal Volume Calculator estimates depth of optimal ETT placement and target tidal volume by height. Endotracheal tube (ETT) depth is measured based on the patient’s front teeth rather than the molars. Larger tidal volumes may be temporarily required for patients with severe metabolic acidosis. Placing the ETT too deep may cause right mainstem intubation, hypoxemia, and pneumothorax. However, placing the ETT too shallow may risk injury to the vocal cords and accidental extubation. Standard approaches to verify ETT depth (eg, bilateral auscultation) are insensitive. Use of lower tidal volumes appears to prevent the development of acute respiratory distress syndrome, even in patients who do not have lung injury. Use in adult patients (aged > 20 years) requiring orotracheal intubation. ETT position should still be verified with a chest radiograph for patients who will remain intubated for an extended period of time. For tidal volume, 6 to 8 mL/kg ideal body weight is generally a safe initial setting, but further ventilator adjustment may be required, depending on the adequacy of ventilation and airway pressures. Obtain chest radiograph and measurement of CO2 level (eg, end-tidal CO2 or blood gas analysis) to confirm ETT position and adequacy of ventilation. The Chula formula was developed and validated by Techanivate et al (2005) at King Chulalongkorn Memorial Hospital in Thailand. The authors prospectively validated the use of this formula among 100 patients in Thailand. Patients were intubated and the ETT placed according to the formula. Subsequently, a bronchoscope was used to determine the relationship among the ETT, carina, and vocal cords. The distance between the ETT and carina ranged between 1.9-7.5 cm. No patient was at immediate risk of endobronchial intubation. The upper border of the ETT cuff was always > 1.9 cm below the vocal cords, avoiding risk of laryngeal trauma or inadvertent extubation. Pak et al in 2010 and Hunyady et al in 2008 developed similar assessments of optimal ETT placement. The average of the 3 scores (Pak, Hunyady, and Chula) is nearly identical to the Chula formula. Techanivate A, Kumwilaisak K, Samranrean S. Estimation of the proper length of orotracheal intubation by Chula formula. J Med Assoc Thai. 2005;88(12):1838-1846. Acute Respiratory Distress Syndrome Network, Brower RG, Matthay MA, et al. Ventilation with lower tidal volumes as compared with traditional tidal volumes for acute lung injury and the acute respiratory distress syndrome. N Engl J Med. 2000;342(18):1301-1308. Hunyady AI, Pieters B, Johnston TA, et al. Front teeth-to-carina distance in children undergoing cardiac catheterization. Anesthesiology. 2008;108(6):1004-1008. The Blast Lung Injury Severity Score stratifies primary blast lung injuries into 3 categories to guide ventilator treatment. Primary blast injury (PBI) occurs when a blast wave accelerates and decelerates while traveling through tissues of varying density. Thus, PBI affects organs with greater air-tissue interfaces such as auditory, pulmonary, and gastrointestinal systems. Primary blast lung injury (BLI) is radiological and clinical evidence of acute lung injury occurring after blast injury that is not due to secondary or tertiary blast injury. The pathophysiology is thought to be due to capillary rupture within alveoli leading to hemorrhage and pulmonary edema, which then reduces gas exchange, causing hypoxia and hypercarbia. Clinical suspicion of primary BLI should be high after blast injury within an enclosed space, as the blast wave becomes amplified as it reflects off of the structural walls (Leibovici 1996). A characteristic chest x-ray shows bilateral diffuse opacities in a “butterfly” pattern. Patients present with hypoxemia with associated pneumothoraces, bronchopleural fistulae, or hemoptysis. In the studies, patients diagnosed with BLI were intubated immediately or within 2 hours of presentation due to respiratory decompensation. Thus, patients breathing spontaneously and adequately 2 hours after injury are unlikely to require mechanical ventilation because of BLI alone (Pizov 1999, Avidan 2005). The Blast Lung Injury (BLI) Severity Score is useful in guiding triage decisions in the setting of mass casualties, determining ventilation treatment, and predicting outcomes. BLI severity correlates with the likelihood of developing acute respiratory distress syndrome (ARDS), and can be helpful to delineate patients who will require more aggressive and potentially unconventional respiratory care (eg, nitric oxide, high-frequency jet ventilation, independent lung ventilation, or extracorporeal membrane oxygenation). 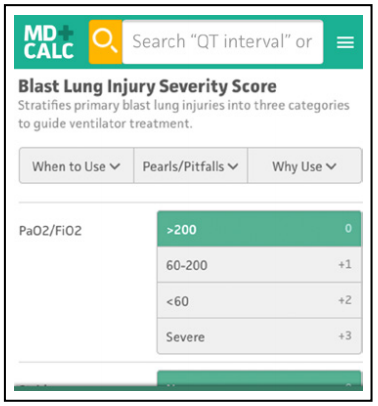 Use the BLI Severity Score in patients who have sustained blast injury and have respiratory symptoms (eg, cough, cyanosis, dyspnea, hemoptysis). Screening chest x-rays for asymptomatic patients are not recommended (Zara 2015), as patients with BLI present either immediately or early with hypoxemia. Contrary to previous belief that the clinical picture of BLI may develop over 24 to 48 hours, studies have shown that patients do not present with a delay in manifestation of lung injury (Pizov 1999, Avidan 2005). Similarly, it was previously suggested that tympanic membrane rupture, the most common primary blast injury, was a marker for increased risk of development of BLI. Studies have shown that tympanic membrane perforation is in fact poorly correlated with BLI (Leibovici 1999, Ballivet de Regloix 2017). Low inspiratory pressure with avoidance of positive end-expiratory pressure (PEEP) is ideal in BLI in order to avoid secondary barotrauma, arterial air embolism, or pneumothorax. However, patients with blast lung often have injury patterns similar to ARDS and require positive pressure ventilation and PEEP. Other treatment considerations include avoiding aggressive intravenous hydration after physiology capture, as it can worsen pulmonary edema, and considering the need for a prophylactic thoracostomy tube before air transportation. Mild BLI patients will usually require volume-controlled or pressure support ventilation modes and PEEP ≤ 5 cm H2O. Moderate BLI patients require conventional ventilation modes, including inverse ratio ventilation as needed, with PEEP 5 to 10 cm H2O. Severe BLI patients require conventional ventilation modes, and commonly require unconventional therapies such as nitric oxide, high-frequency jet ventilation, independent lung ventilation, or extracorporeal membrane oxygenation. The PEEP requirement is > 10 cm H2O. The original BLI Severity Score was proposed in 1999 by Pizov et al. The study evaluated 15 patients with primary BLI after explosions on 2 civilian buses. BLI Severity scores were compared to Murray scores for acute lung injury at 6 and 24 hours after injury; at 24 hours, there was good correlation between the proposed BLI score and the modified Murray score. Three of the 3 patients (100%) with severe BLI who were still alive after 24 hours (1 patient died within 24 hours from intrapulmonary hemorrhage after being placed on extracorporeal membrane oxygenation) and 2 of 6 patients (33%) with moderate BLI developed acute respiratory distress syndrome (ARDS) (Murray score > 2.5). None of the 5 patients with mild BLI developed ARDS. Other unconventional respiratory therapies such as independent lung ventilation, high-frequency jet ventilation, and nitric oxide were used in patients with severe BLI with improvements in their PaO2 levels. When comparing mortality rates, 4 patients with severe BLI died, all 6 patients with moderate BLI survived, and 1 of the 5 patients with mild BLI subsequently died from a traumatic head injury. One year after the study by Pizov et al, Hirshberg et al conducted a follow-up study of the 11 surviving original patients. None of the 11 survivors had pulmonary-related complaints, and lung physical examinations were normal with complete resolution of chest radiograph findings. In comparison, Avidan et al, in 2005, evaluated 29 patients with primary BLI, and only 1 patient had died (death occurred 24 days after admission from sepsis and multiple organ failure). The authors concluded that death because of BLI in patients who survived the explosion is unusual. Although these 29 patients were not categorized by BLI severity scores, there were 7 patients with PaO2 / FiO2 ratios < 60, 4 patients requiring positive end-expiratory pressure (PEEP) > 10 cm H2O, and 3 patients requiring unconventional therapies such as high-frequency ventilation or nitric oxide inhalations. The decreased mortality rate compared to Pizov et al, despite the presence of patients with characteristics of severe BLI, may be attributed to improvements in critical care and respiratory management. The study also assessed long-term outcomes by contacting 21 of 28 survivors (75%) from 6 months to 21 years after discharge. Sixteen patients (76%) were free of respiratory symptoms and did not require respiratory therapy. Five patients (24%) reported respiratory symptoms but 2 of the 5 had a past medical history of asthma and another 2 of the 5 were contacted less than 1 year after injury. Pizov R, Oppenheim-Eden A, Matot I, et al. Blast lung injury from an explosion on a civilian bus. Chest. 1999;115(1):165- 172. Hirshberg B, Oppenheim-Eden A, Pizov R, et al. Recovery from blast lung injury, one-year follow-up. Chest. 1999;116(6):1683-1688. Avidan V, Hersch M, Armon Y, et al. Blast lung injury: clinical manifestations, treatment, and outcome. Am J Surg. 2005;190(6):927-931. Matthews ZR, Koyfman, A. Blast injuries. J Emerg Med. 2015;49(4):573-587. Scott TE, Kirkman E, Haque M, et al. Primary blast lung injury - a review. Br J Anaesth. 2017;118(3):311-316. Leibovici D, Gofrit ON, Stein M, et al. Blast injuries: bus versus open-air bombings—a comparative study of injuries in survivors of open-air versus confined-space explosions. J Trauma. 1996;41(6):1030-1035. Ballivet de Regloix S, Crambert A, Maurin O, et al. Blast injury of the ear by massive explosion: a review of 41 cases. J R Army Med Corps. 2017:163(5):333-338. Cannon JW, Hofmann LJ, Glasgow SC, et al. Dismounted complex blast injuries: a comprehensive review of the modern combat experience. J Am Coll Surg. 2016;223(4):652- 664.e8. Describe different methods of thoracic decompression of pneumothorax and hemothorax and select patients who require admission. Date of Original Release: June 1, 2016. Date of most recent review: May 10, 2016. Termination date: June 1, 2019. ABIM Accreditation: Successful completion of this CME activity, which includes participation in the evaluation component, enables the participant to earn up to 4 MOC points in the American Board of Internal Medicine’s (ABIM) Maintenance of Certification (MOC) program. Participants will earn MOC points equivalent to the amount of CME credits claimed for the activity. It is the CME activity provider’s responsibility to submit participant completion information to ACCME for the purpose of granting ABIM MOC credit. Objectives: Upon completion of this article, you should be able to: (1) summarize the work-up, disposition, and immediate treatment of blunt thoracic trauma patients; (2) assess the benefits and pitfalls of different imaging modalities; and (3) describe different methods of thoracic decompression of pneumothorax and hemothorax and select patients who require admission. Faculty Disclosure: It is the policy of EB Medicine to ensure objectivity, balance, independence, transparency, and scientific rigor in all CME-sponsored educational activities. All faculty participating in the planning or implementation of a sponsored activity are expected to disclose to the audience any relevant financial relationships and to assist in resolving any conflict of interest that may arise from the relationship. In compliance with all ACCME Essentials, Standards, and Guidelines, all faculty for this CME activity were asked to complete a full disclosure statement. The information received is as follows: Dr. Morley, Dr. Johnson, Dr. Leibner, Dr. Shahid, Dr. Parekh, Dr. Tainter, Dr. Jagoda, Dr. Shah, Dr. Damilini, Dr. Toscano, and their related parties report no significant financial interest or other relationship with the manufacturer(s) of any commercial product(s) discussed in this educational presentation.